Expert design and installation for landscapes and gardens of any size. Not quite sure how to make your property more attractive? Need help planting a few shrubs or a beautiful specimen tree? Ready to replace that crumbling patio or walkway? 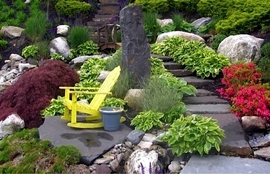 Hilltop Nursery & Garden Center is your “one stop” for all your landscaping and masonry needs. From a single garden bed installation to a complete landscape re-design Hilltop Nursery can provide you with expert design and installation services, or if desired we can implement your existing plans or specifications for you. Whether you want to custom design a completely new landscape or would like to revive an older one, we can create a look and feel for your outdoor environment that is professional, inviting and adds property value. No matter the size or your project, proper landscape design will include a careful combination of shrubs, flowers, trees, lawn, hardscape (walkways, patios, walls) and other various architectural elements. Our landscape professionals have extensive horticultural knowledge and design experience and understand how to use plants and other design elements that will compliment the natural landscape.